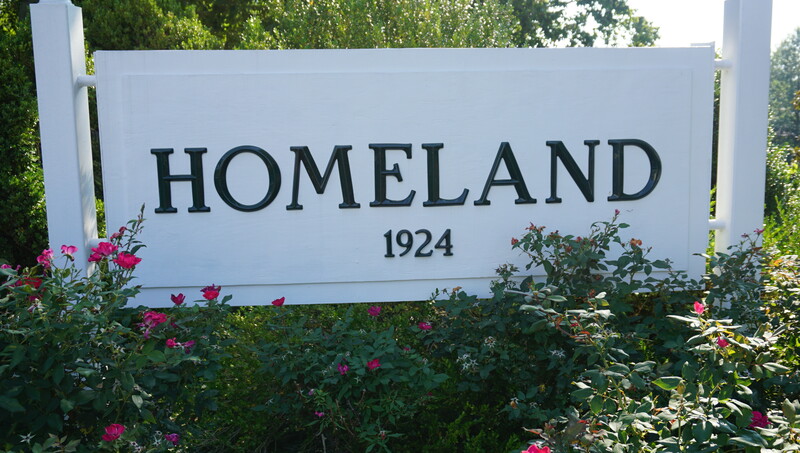 Established in 1924, Historic Homeland was created on the land of the Perine estate, called “Homeland”. Located in the northern part of Baltimore City, there are 978 homes for sale in Homeland that represent a unique mix of Georgian, Norman, Tudor, French Country, Colonial, and Early American architecture set amongst six decorative lakes and mature trees. As a covenant community, Homeland’s Community Association takes an active role to ensure that the architectural integrity of the homes and neighborhood appearance work to preserve property values which can range from $300,000 to over $1,500,000. Moreover, Homeland’s Historic designation currently allows homeowners to receive a 20% tax credit for the qualified restoration work. With Homeland’s rolling landscapes, beautifully manicured lawns and six lakes, residents and visitors alike are attracted to Homeland’s tranquil atmosphere. Moreover, with its close proximity to local and regional shops, schools (numerous choices from public, private, parochial, and charter schools as well as major well known Universities such as Johns Hopkins, Loyola University, and College of Notre Dame)., hospitals, cultural centers, and places of worship Homeland makes sense if you are looking for a quaint neighborhood yet close to all of the conveniences one would expect living in Baltimore City. Ready to check out all that homes for sale in Homeland has to offer? If so, give me a call at 443-564-0952 or send me an email. I will be happy to create a free, no obligation automated home search for you that will deliver homes meeting your criteria directly to your email. Once you have identified the homes for sale in Homeland that you want to see we can schedule a visit. Stunning new construction in Homeland (2006). Tudor style stately 5,400 sqft+/- manse with stucco exterior and slate roof. First floor master bedroom suite with huge master bath and closets galore. 21st century kitchen with every conceivable upgrade including double islands and wonderful glass breakfast area. 2nd floor features 2 en-suite bedrooms and loft on 1 side and separate stairs to a grand bedroom and guest area on the other side. Gigantic unfinished lower level with high ceilings. Every attention to detail. Must see. Gorgeous Georgian architecture abounds in this Palmer and Lamdin home. Upon nearly an acre of land on a spacious corner lot, lush landscaping embellishes the property. With a kitchen and first floor completely renovated and designed by Patrick Sutton, the huge first floor with an open feel leads to a gorgeous yard. A potential of up to seven bedrooms makes this a dream spot for frequent entertainers or even those who need extra space for offices. Multiple fireplaces ensure a cozy stay at any time, and the symmetrical layout gives a sense of order. New hardwood floors, recessed lighting and pendant light fixtures throughout the house bring a sense of light and accent, while the French casement doors and windows shed light on everything in the house. Marble floors in the basement and sun room add an airier feel and are a perfect juxtaposition to the warmth of the hardwoods in other areas of Churchwardens. When in need of a respite from the lovely interiors, step out onto the lush landscaping that surrounds the property. With a few different spots to enjoy nature, you can feel at ease under the pergola facing Churchwardens, the patio off of the kitchen and family room, or just enjoy the spacious yard itself. A large parking pad/driveway next to the kitchen door, along with a huge garage add a ton of convenience to this incredibly lovely home! Roland Park school system. This handsome brick colonial situated on a prime block in Homeland has been thoroughly and meticulously updated inside and out. After the twin bay windows greet you from the street and the Southern light follows you through the front door, you're immediately greeted by an immaculately kept, well-proportioned, gracious home. The gourmet eat-in kitchen with Sub-Zero refrigerator and Wolf range is a chef's delight. The sunroom/family room is a cozy and bright gathering space that opens with french doors to the private rear courtyard. The extensive list of improvements done over the last 5 years include: complete build-out of lower level adding 2 BRs plus a full bath, renovated powder rm and 2 baths, 3rd floor renovation, 2nd floor terrace, remodeled sunroom/family room...plus much more. No detail was discounted in this sophisticated and impressive brick colonial. Picture perfect and completely renovated porch front four bedroom, three full and two half bath home on picturesque lot with fenced yard, patio, two car garage and parking pad on tree lined Upnor Road. Stunning chef's kitchen with stainless appliances and granite counters open to adorable screened in porch. Master Suite with luxurious full bath, spacious bedrooms and a third level with fourth bedroom and bath. Bright finished lower level with recreation room, bath and plenty of storage. Five years left on chap tax credit! Nothing to do but move in! Beautiful and Spacious 4BR/2.5 Bath Stone & Brick Colonial on one of the largest lots in Homeland now available! ALL FOUR BEDROOMS ARE ON THE SECOND LEVEL! Steps to the prep schools - walk to Friends, Cathedral and a short stroll to Loyola College. You'll fall in love with this large beautiful picturesque center stair colonial on one of the most prominent blocks in Homeland with almost 3,000 finished sq ft on a triple lot with .6 of an acre surrounded by gorgeous landscaping. This home features a gorgeous sun room off a huge family room with a wood burning fireplace, a formal dining, stainless steel appliances, gleaming wood floors throughout and a remodeled attached master bathroom. Every room is huge! This home has been thoroughly updated along with a generous finished basement. Enjoy the outdoors with a large rear slate patio with built-in bench. A driveway plus a two-car attached garage. Time to fall in love and be in before the holidays! This impeccable center hall colonial on one of the most sought-after streets in Homeland presents a seamless floor plan that is equally conducive to casual living and refined entertaining. Notable features include rich hardwood floors on the main and upper levels of the home, living room with gas fireplace, a spacious eat-in kitchen with stainless steel appliances, granite counter tops, new French door refrigerator, a large pantry, and first floor laundry. The lower level family room offers a wood burning fireplace and recessed lighting. Further enhancing the appeal of the home is the awning covered stone patio overlooking the delightfully landscaped and fenced back yard creating a very private setting. The exterior is enhanced with copper gutters and downspouts, and a one car garage. This lakefront Southern Colonial in Homeland has been transformed into a stunning, up to date home with checks in all the boxes! Every surface has been painted or restored. The kitchen has been re-invented. All baths have been replaced or updated. Tucked nicely into the center of the neighborhood on a quiet street, this home welcomes you with generous spaces and gleaming wood floors. The quartz counters and quiet-close white cabinets make the kitchen a dream come true. The breakfast nook is really an extension of the kitchen with a place to sit and drink your coffee while pondering what to cook next. Don't miss the details; glass doors, a wine rack, transom cabinets, 5 burner range. The first-floor family room looks out over the large stone patio in the private yard. Cozy up to the wood burning fireplace in the living room. Entertain your guests in the lovely square dining room. A first floor half bath and coat closet complete the picture. Upstairs delights with a huge master bedroom with en-suite bath and French doors leading to the second-floor porch overlooking the ponds. 3 additional bedrooms share 2 baths. The lower level has brand new carpet in the large game room, a generous laundry/utility room with extra storage and a half bath. The two-car garage is entered from the alley. This home is zoned for Roland Park Elementary/Middle school.